Students can explore potential for wind power at locations around their own or other states. Downloadable spreadsheet of tabular data enables users to produce and compare graphs of patterns they notice in the animated maps. 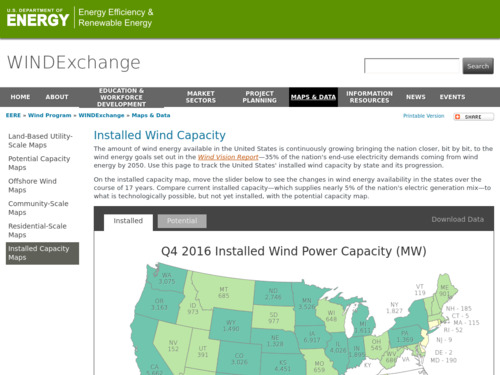 State-by-state data allows students to compare wind power in their own state to others. Though installed wind power has increased very rapidly, students should be aware that the total amount of electricity produced by wind is still very small compared with the amount produced by fossil fuels. Time series of maps showing installed wind capacity (in megawatts) by state in the U.S.
Mapped data are available as a downloadable animated GIF, a series of still JPG images, and printable PDFs. State-by-state data are also available as a downloadable spreadsheet.